Steliana Nistor, the silver medalist in the all-around at the 2007 World championships, is retiring, according to this post on a Nistor fan blog. Apparently, she will be focusing on her studies at the Sports Academy in her hometown of Sibiu. Unfortunately, this is not surprising news, given that she did not accompany the team to their retreat on the Black Sea after the Olympics and, more importantly, the fact that she has been facing major back problems for over a year. What Nistor will be remembered for, unfortunately, will probably be two things: first, that she placed the dreaded fourth in a number of all-around competitions; and, second, that she appeared to be routinely overscored despite major form problems. 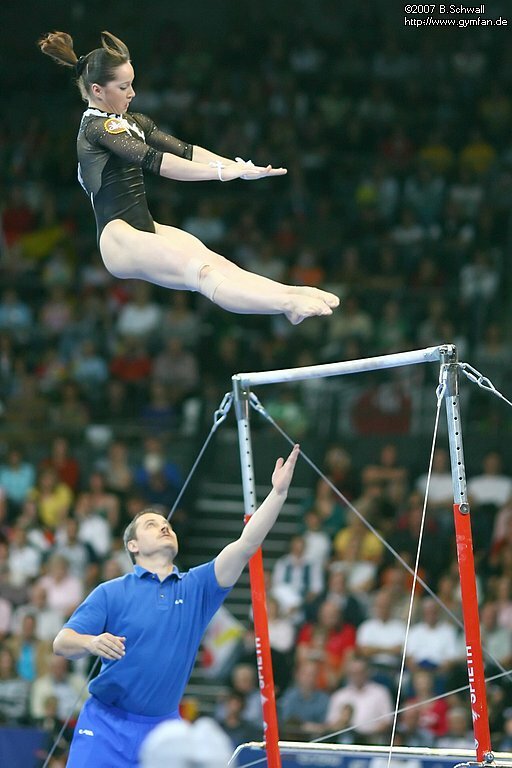 Nistor was a mainstay of the Romanian gymnastics team in this quadrennium, and I’m going to miss her. I enjoyed her especially on beam and, as I mentioned, floor. For a Romanian in recent years, moreover, she had quite a good bar routine. She had some cool skills, too, including a Ray on bars, and a handspring to back full on beam. ETA 9/30: Apparently Forminte and Nistor will be having a meeting to make a final decision, at least according to Forminte. Something tells me Nistor has made up her mind … but maybe there’s still hope she’ll continue. The meeting is supposed to be held in the next few days. ETA 10/1: According to this post — hey! I’m learning Romanian! — Forminte and Nistor talked, and he has accepted her retirement. 1 Response to "Steliana Nistor retiring"
I see what you mean about the precision while still having air faults. It’s like she really knows where she is on the landing and is always well high enough. But still has soms slop on the full in and the dlo in terms of legs.